What is a Plaque Award? This entry was posted on February 7, 2018 by Jessica Anderson. An example of a small engraved plaque, also called a plate. Plaque: A small etched plaque, usually made of medal, but can also be made of plastic or cast bronze. These plaques are small in size, usually just a few inches, and attached to an object, such as a frame, piece of artwork, bench, eagle scout project, industrial panel, etc. Also known as an engraved plate. These small plaques commemorate a special project, name an artist, explain an artifact, etc. Plaque: A larger engraved wall plaque that is a type of recognition award. 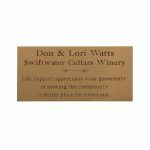 Wall plaques are most often made of wood (but can also be made of glass and acrylic, a plastic polymer) and contain a special customized message inscribed on the plaque. The text and often times organization logo is either etched directly into the wood or on another medium, such as a brass or aluminum plate, which is then attached to the wood. This is a traditional corporate recognition award that can be hung on a wall and admired for years to come. An example of a perpetual wall plaque with a header plate and smaller plates for names. 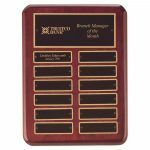 Perpetual Plaque: Another type of wall plaque, this plaque contains a larger plate at the top (called a Header Plate) which lists the name of the award and often times organization name. Below are smaller individual plates, often times called perpetual plates, that can list winner's names and dates. This award is perpetual, meaning that you can add to it over time. It makes a great way to showcase your businesses "employee of the month" winners, for example. To see all plaques at Trophies2Go, view our Plaque category, including engraved plates, wall plaques, and perpetual plaques.